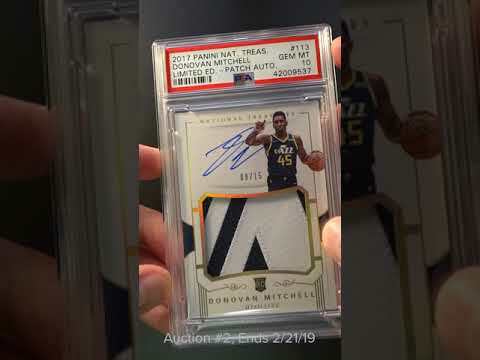 The holy grail of Donovan Mitchell rookie cards. Since being drafted #13 overall, Donovan Mitchell has quickly became one of the most electric young stars in the game today. Recently compared to Vince Carter, Mitchell is among the best dunkers in the NBA and was the 2018 Slam Dunk champion. On top of his elite electrifying ability, Mitchell has posted all-star type numbers with a career 21.2 PPG. It's not unreasonable to say that this guy is going to be a future great. Presented here is a truly breathtaking National Treasures example which ranks as his single most important and popular rookie cards. Seldom seen in PSA 10, the offered copy is just one of three to reach the illustrious designation and is limited to just 15 copies ever produced. Easy to say that the demand far out weighs the supply. The card possesses four untouched corners with ultra clean borders and smooth edges around. Perfectly centered with tremendous print and registration. The surfaces are completely uncirculated and void of any imperfections. The autograph is undeniably pristine and the jersey swatch is a gorgeous two color example. All-in-all, we love this card. When seeking a blue-chip modern investment piece which has a high ROI possibility; look no further. This is an all around stunner which comes with our highest recommendation. Enjoy! Part of a remarkable run of high-grade '17 National Treasures basketball examples on the auction block this month. One of over 15,000 cards, lots, and sets up for bid in our 2nd Auction of 2019. Click on the link above to view the other PWCC auction lots. The PWCC Vault is now live! Open a PWCC Vault account and receive a custom Vault shipping address. Purchases shipped to the Vault receive free shipping and reflect Oregon's 0% sales tax rate.